Acropolis Associates is an Executive Search consultancy that assists multinational organizations, medium sized enterprises as well as smaller niche companies to attract and retain outstanding C-Level executives (CEO, COO, CFO, CIO, CTO …), senior managers and directors. In addition to this core business, we provide recruitment services, supporting organizations to recruit Technical Managers and Experts. We focus on positions based in China Mainland and Asia, or any China-Asia related positions based at our clients’ headquarter in Europe or North America. 8 – Our fee is, as far as possible, adapted to the hiring budgets of our clients: we don’t compete to be the less expensive one but we ardently fight to deliver the most valuable service. Competition is fierce in Asia; our clients want results. It is how we retain them. Are we able or not? Before sending any proposal or before signing any contract, the very first step for us is to evaluate if we are totally sure to be able to find the right candidate and effectively fulfill a position. We don’t chase contracts and fee: we accept to handle assignments only if we can guarantee to deliver. We are not magicians; we are not able to create candidates if they don’t exist according to client expected profile. If client’s expectations are unrealistic, it is our duty to advise and to help define the right relevant profile. 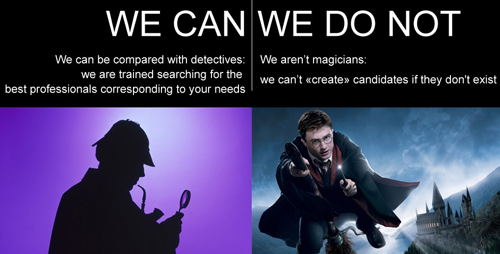 One of our clients compared us to Sherlock Holmes! Our methods are very similar to those used by investigators; we have the ability to identify most of existing candidates corresponding to a profile in a specific area. To meet our client needs precisely, our consultants work in global practices defined by industries and organizational functions in which they have significant experience. We stay on the leading edge of what matters most in your world, and maintain close personal connections with the best talent in your field. Our Manufacturing & Industrial team covers several industries including Automotive, Aviation, Aerospace, Plastic, Chemical, Electronic devices, Fashion, Garments, Textile, Food. Pharmaceutical, Biotechnology, Biosciences, Diagnosis, Veterinary & Animal Health (animal food & animal nutrition), Medical Equipments, Medical Devices, Medical iImaging, Cosmetics, Infant nutrition, Human Food Security & Traceability).